The hutongs of Beijing are like time tunnels back to old China. First-time visitors to Beijing may worry that they’ve taken a wrong turn when they alight on trafficked streets dominated by modern skyscrapers. But by exploring the narrow streets and twisted alleys (called hutongs) in older areas of the city, they can get a sense of traditional Chinese life centuries ago. It’s fun to zip through on a rickshaw or sidecar, but the best way to visit is on foot, so you can rub shoulders with residents and peek inside doorways. Hiring a local guide who speaks the language, knows the neighborhoods and has a double doctorate in Chinese and Tibetan studies also helps. We met Valentina Punzi, a docent with Context Travel, in a Costa coffee shop across from the Lama Temple, just outside the Wudaoying Hutong. Hutongs (from a Mongolian word for water well) are passageways formed by the rows of gray courtyard compounds (called siheyuan) that line their sides. Typically, these crowded compounds house multiple families who share a kitchen. In the spring, convivial retirees play mahjong and cards outdoors while some bask in the sun. The oldest hutongs were erected during the Yuan Dynasty (1260-1368), but their numbers increased through the early 1900s. 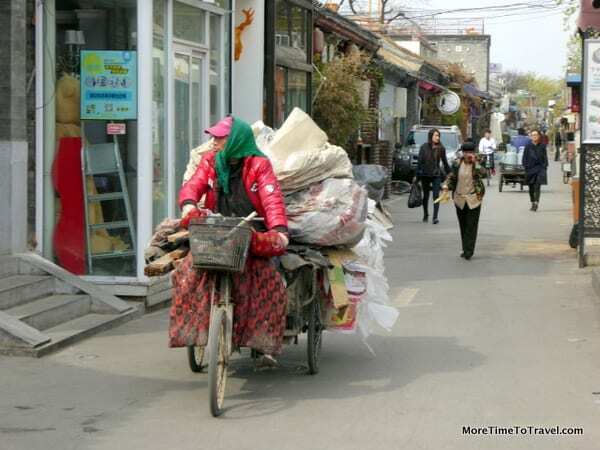 The China National Tourism Administration estimates that 4,550 hutongs remain in Beijing. On our walking tour, called Hip Hutongs, Punzi led us through five of them, pointing out transitions that had taken place over the last decade. In some areas, inhabitants still use coal firebricks for heat and rely on communal restrooms without running water. In recognition of their cultural and architectural importance, the Chinese government has protected some of these buildings. Other hutongs have become gentrified and are now lined with bars. While such a transition has altered their character, it has benefited older landlords economically, allowing them to retain their homes and way of life. This article written by Irene S. Levine appeared in the Sunday Travel section of the Chicago Tribune on Sunday, August 16, 2015 and in the Orlando Sentinel.